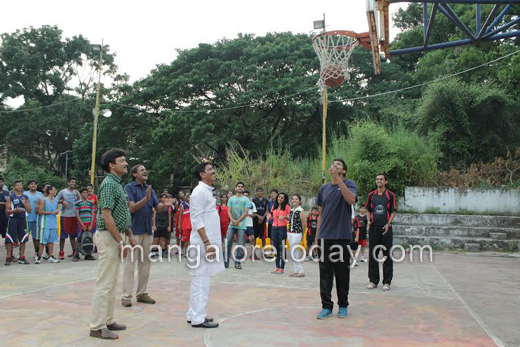 Mangalore, Oct 17, 2014 : `CREST for Kashmir’ Cup Basketball Tourney Got off to a Jump Start with the Mayor of Mangalore City Corporation, Mahabala Marla trying his skill in shooting a basket at the Mangala Outdoor Stadium in the city on Thursday. Over 30 teams are eyeing on the trophies in various categories that include Boys, Girls, Mens and Women’s Open. 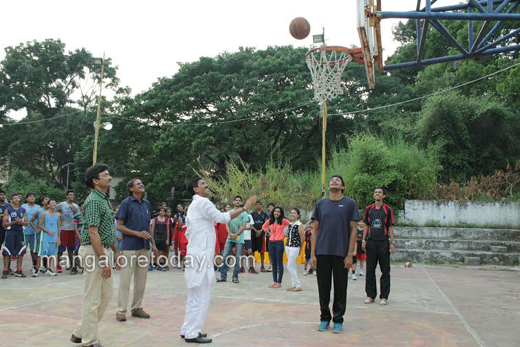 The tournament is being organized as part of the `CREST for Kashmir’ Initiative launched by CREST (Creating Resource to Empower Society Today), the youth wing of Centre for Integrated Learning, in association with Mangalore Basketball Club. The 3 on 3 Basketball Tournament organised as a fund raiser to help the needy people of Kashmir which was devastated by the floods in September. The matches are being played in a league format and is open to all. While the prelims takes place on Thursday and Friday, the semi-finals and finals will be played on Saturday. President of NBC Naveen Shetty, Coordinators of `CREST for Kashmir’ initiative Arun Mallya and Vaishnavi Rai, CREST office bearers Vaishnavi Pavithran, Aditya Hegde, Hrishikesh Shetty, Sanjana Pai among others were present at the informal inaugural function.